These tins filled with yummy homemade candy are perfect gifts for neighbors and also make a great hostess gifts for all your holiday shindigs. As an added bonus they are super easy to make. Bake at 400 degrees for 5 to 6 minutes. Remove from oven and sprinkle chocolate chips over the top. Let the chips sit and melt for a minute and then use a spatula to spread the chocolate around. Top with nuts. Cool completely and break into pieces. * you can also use graham crackers. I prefer saltines because I like the sweet/salty combo. **feel free to experiment with different toppings. I prefer walnuts and I also like to sometimes throw some Heath pieces on top too. Or you can get really festive and throw some chopped candy cane bits on it! 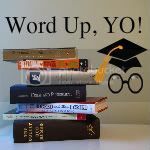 *I'm trying my hand at a new link party and participating in Word Up Yo! Join in the fun here. -Please link up a recipe below and if you would be so kind as to grab my button and put it in your post I would be grateful! That sounds delectable and easy. These just might get added to my shindig. Sounds easy! I'm your newest follower! I hope you will visit back! 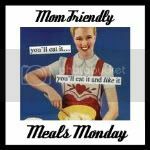 I'm your newest follower from Mom Blog Monday! Would love to have you follow me back! I just voted for you! Thanks for hosting the linky!